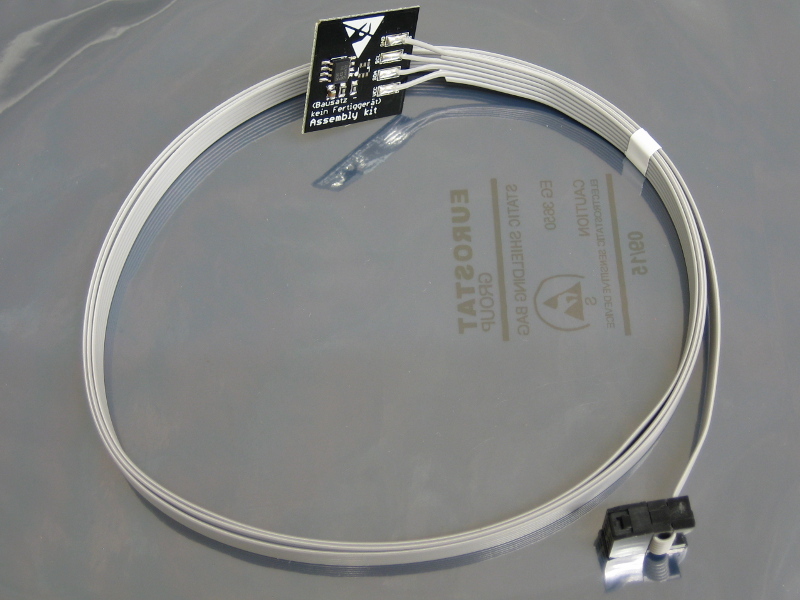 This optional sensor board (25 mm x 25 mm; 1“ x 1”) is designed to measure water temperature. It has to be mounted on the outside of the glas and then insulated by sticking some polystyrene or other foam plasic over it. 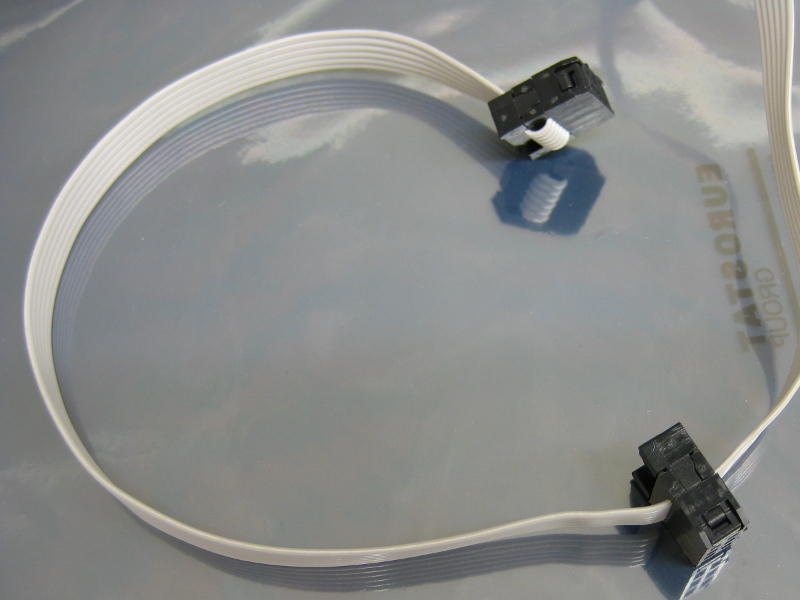 CoolTWITemp is shipped with a cable and plug and is connected to CoolTWILED's or BlueTWILED's “Link” port. Wire 1 is either marked red and/or there is also a little arrow on the plug (near the tab) which has to point at pin 1. Scale division for the graph: One vertical pixel represents 0.1 degrees Celsius and one horizontal pixel represents 12 minutes. The latter can be adjusted in the “Expert options”. One character is exactly 5 pixels wide (there is a small gap in between), so one character represents one hour by default. 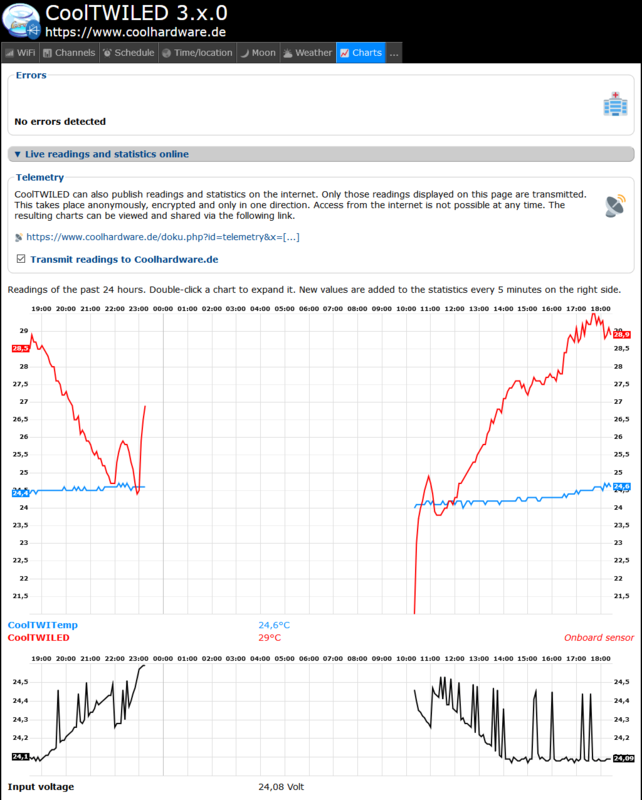 The height of a character is 8 pixels, so that fluctuations of 0.8 degrees will make the rest of the graph disappear. For bigger projects, one or more CoolTWILED 3.x SLAVE / BlueTWILED 2.x SLAVE boards can connected to one CoolTWILED or BlueTWILED “master”. All connected slave boards will behave exactly like the Master board, i.e. all B channels will behave the same, all G channels, and so on. Please also have a look at the manual of the Master and Slave boards. 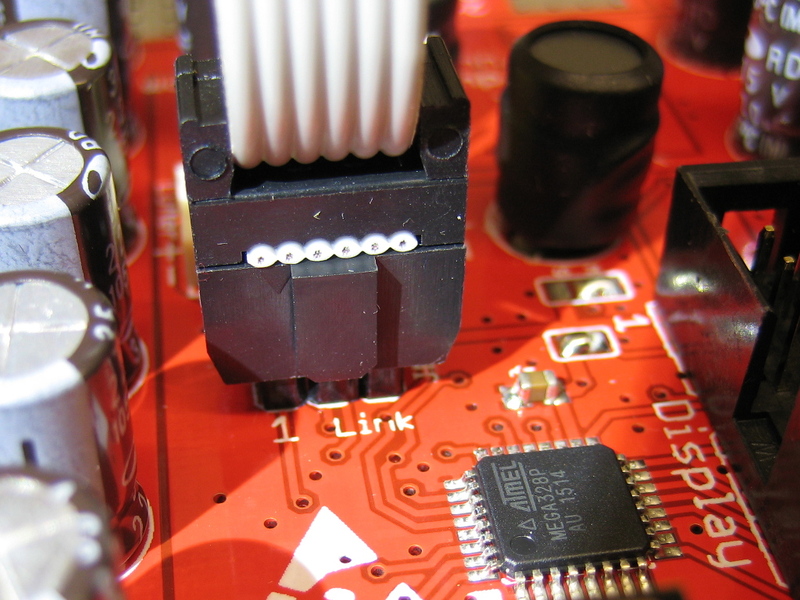 The link between the boards is made through their “Link” ports, by connecting the cable of the temperature sensor to all boards. Please do not forget ordering one along with your slave board(s). Only one sensor is necessary (and only one can be connected to the Master). Per Slave board one additional plug is enclosed, which has to be clipped to the temperature sensor cable in the desired position (carefully use pliers). Please mind pin 1. It is marked on the plug and the board. It is recommended to keep the distance between Master and Slave small. In Master/Slave configuration all boards need to be wired separately, both input and outputs. If you use more than one power supply, their grounds have to be connected together. Please connect or disconnect cables only when powered off, i.e. unplugged power supply. Please mount the sensor so that no short circuits to other metal parts can happen. Before powering on, please re-check that no wiring mistake has been made.